(KPL) The Japanese Government provided grant assistance worth 522,590 US dollars for three health centre projects in Pongsaly, Huaphan, and Saravan provinces, and six water supply system projects in Oudomxay, Xayaboury, Xieng Khuang, Huaphan, and Luang Prabang provinces through its Grant Assistance for Grassroots Human Security Projects (GGP). 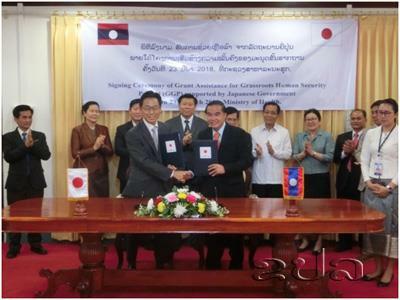 On March 23, 2018, grant contracts for nine GGP projects in health were signed at the Ministry of Health in Vientiane between Mr. Takeshi HIKIHARA, Ambassador of Japan to the Lao PDR, and eight directors of the Health Departments, representing respective provinces and districts, while being witnessed by Dr. Phouthone Moungpak, Vice Minister of Health, and other officials concerned. The three projects for the construction of health centres will be implemented in two areas, one out of which currently has no health centre and the other out of which use an assembly hall as a health centre. This project aims to improve access to health services by constructing new health centres with six to seven rooms and providing medical equipment. As a result, 11,236 residents in 23 villages will greatly benefit. The six projects for the construction of water supply systems will be implemented in five provinces. In some villages, even though a water supply system exists, safe water is not available to all residents because its capacity is limited. In other villages, there is no water supply system, residents use water from neighboring streams for daily use and drinking water. These projects aim to improve access to safe water by installing new water supply systems, which include suction water tanks, decompression tanks, water storage tanks, water pipelines, and water distribution points.